Falsely imprisoned for the murder of his wife and her lover, Andy Dufresne faces years behind bars at Shawshank prison where he will encounter both uplifting joy and vicious horror at the hands of the various inmates and prison officials, including the enterprising Red and the corrupt Warden Stammas. Andy comes to find an inner strength and resolve and discovers that the true meaning of freedom lies within the unbroken spirit. Based on the novella "Rita Hayworth and Shawshank Redemption", from Stephen King's "Different Seasons" collection, and the 1994 movie, the theatrical version of "The Shawshank Redemption" is adapted by Owen O'Neill and Dave Johns and uses material drawn from both sources so feels fresher than if it were based solely on one or the other. The script is rather episodic in its telling of the plot and can seem a little heavy on the exposition at times which can be a little lazy and tiresome to watch. David Esbjornson's direction seems at odds with the episodic storytelling and his more naturalistic approach extends into the design of Gary McCann with these elements combining to create some uneasily paced moments onstage with the momentum often stalled and restarted, though this is more or less rectified following the interval to the benefit of the production. But together with the presence of dead space on the stage and cumbersome, slow transitions this all adds up to uneven staging and one wonders if a more abstract, Brechtian approach would be a more appropriate storytelling device. More successful was the lighting design of Chris Davey and the sound design of Dan Samson which was aurally effective and well balanced with great choices in the music selections played throughout the production (used to cover scene changes or to denote a change of era). Paul Nicholls as 'Andy Dufresne' is an attractive lead but his performance is unsure and is played at a stuttering pace in the first act. He does improve greatly in the second act, however, and begins to come into his own by the end of the play. Ben Onwukwe as 'Red' is far more successful, handling the exposition easily. His is the true central role and it is through 'Red' we come to know the other characters so Onwukwe's performance is the most important in the play. Thankfully he is adept at the task and, though a trifle restrained by the occasionally clumsy piece of direction, is deftly able to bring the audience along with him as the play progresses. As 'Warden Stammas', Jack Ellis is underused and is never really given time to make the impact required of the character. In the moments he has, however, he makes the most of them and is able to project the necessary elements of the role. In what is, for all intents and purposes, something of an ensemble piece the remaining cast members are a boon for the production and they are essential in keeping the stage alive with each character a unique figure in a world that could easily be populated with non-entities. Andrew Boyer's moving 'Brooksie', Daniel Stewart's strong 'Hadley' and Nicholas Banks' energised 'Tommy Williams' are among those who make an impression but the whole ensemble is a strong and vitally necessary one. "The Shawshank Redemption" is sadly let down by serviceable direction but performed by a cast that, for the most part, rises above this limitation to perform a script that shows real promise which, given a little revising, deserves a more appropriate staging. "The Shawshank Redemption" deserves better and hope springs eternal. 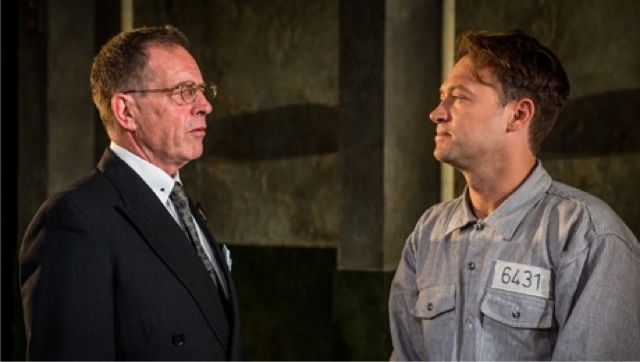 The Shawshank Redemption is at the Theatre Royal, Glasgow until Saturday 26th November.